"You will love this book. Matt's unique way of storytelling will engage you from page one and leave you inspired to live up to your full potential!" -- Mark Batterson, New York Times best-selling author, The Circle Maker"Matt is a new voice in leadership and one you need to listen to. Matt's book will inspire you to take on the next challenge and be the leader God has called you to be." -- Brad Lomenick, president and lead visionary, Catalyst Conferences; author, The Catalyst Leader. @BradLomenick"Everyone loves an underdog. 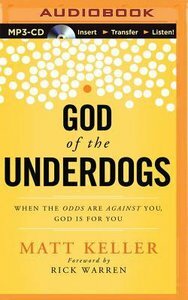 In this book, Matt Keller shows us that God does too. God of the Underdogs will guide you beyond your limitations and into a realm where only God-powered potential exists." -- John Bevere, author and speaker, Messenger International,Colorado / Australia / United Kingdom* Ever felt like the underdog? * Like you're just not good enough? * Like you lack the confidence to pursue your dreams?If so, you're not alone. The Bible is full of ordinary people that the world considered underdogs, but God chose them to change the world.God of the Underdogs taps into a recognizable metaphor to show how the Creator of the universe wants to use you to accomplish great things for him. By weaving his own underdog story with the stories of some of the Bible's greatest underdog heroes, Matt Keller demonstrates that men and women like Moses, Esther, King David, the apostle Paul, and even Jesus shared the "But I can't..." sentiment. They considered themselves ordinary -- but God saw them as extraordinary!God wants to use your life in a unique way. God sees your potential. So rise up, underdog! Beat the odds, live your dream, and change your world! About "God of the Underdogs: When the Odds Are Against You, God is For You (Unabridged, Mp3)"